Premiering January 26 on The CW. Meanwhile, girl-next-door Betty Cooper (Lili Reinhart) is anxious to see her crush Archie after being away all summer, but she’s not quite ready to reveal her true feelings to him. And Betty’s nerves, which are hardly soothed by her overbearing mother Alice (Mädchen Amick), aren’t the only thing holding her back. When a new student, Veronica Lodge (Camila Mendes), arrives in town from New York with her mother Hermione (Marisol Nichols), there’s an undeniable spark between Veronica and Archie, even though Veronica doesn’t want to risk her new friendship with Betty by making a play for Archie. And then there’s Cheryl Blossom (Madelaine Petsch)... Riverdale’s Queen Bee is happy to stir up trouble amongst Archie, Betty and Veronica, but Cheryl is keeping secrets of her own. What, exactly, is she hiding about the mysterious death of her twin brother, Jason? 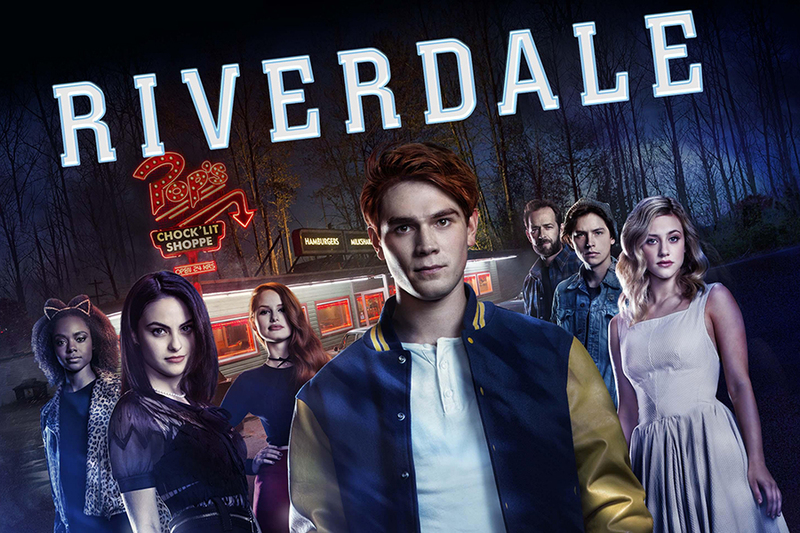 Riverdale may look like a quiet, sleepy town, but there are dangers in the shadows. The first four episodes are amazing. You guys are going to love the show for sure. If you have questions about the show let me know and I'll respond to some questions. Wait, how did you watch the first 4 episodes Ryan? For my job (well one of them). CW sent them to me for review. Your job? Omfg Ryan what do you do? And I was skeptical at the tone of the show but I'm interested. It's Twin Peaks meets Gossip Girl. IMO it's not one just one of the best CW shows that's premiered, but one of the best shows this season. You don't have to have read Archie to follow the show. They do a good job of introducing this version of the characters, and slowly reveal more about them as the episodes go on. It's smart, funny, progressive and most importantly, the acting is top notch. The veteran cast (Luke Perry, Mädchen Amick, etc.) have interesting storylines as well (you learn how connected the teens are). For instance, Betty's mom (played by Amick) is really overbearing and hard on her to the point where it manifests itself in strange ways. You can put yourself in Betty's shoes and be like, "Damn, with a mom like that how is she functioning". It's so good. KJ Apa (Archie) is half-naked in every episode (Bless this). But he's actually a good actor too. His story is messy but it draws him back to his friends. I'm excited for this. Archie used to be my obsession when I was 6 or 7.
so excited to watch this any word about it being on a streaming service? 61 on Metacritic so far. Hmm, recent offbeat dramedy Sweet Vicious on rival network MTV got a 72. Expect it to be trash (like 80% of CW's programming), but I'll watch the first few eps at least. Also surprised about the person raving about it above, as the best review I've seen for it was along the lines of "it's good for what it is, I guess"
excited af for this, I am a MASSIVE Archie Comics stan. It's Twin Peaks meets Gossip Girl. IMO it's not one just one of the best CW shows that's premiered, but one of the best shows this season. Why did they make this like a horror show when it was supposed to be a comedy? They destroyed the original. I'm probably gonna check this out. I like the tone/feel. I doubt it's going to be super acclaimed or anything but I'm sure it'll be enjoyable for what it is. I'll probably start watching this since the protagonist is hawt.